In Girona you can see Roman and medieval structures, visit museums, relax in the Plaça de la Independència, and take a stroll along the Onyar River. Our favorite part was wandering through the gorgeous narrow passageways in the Jewish Quarter / Call. 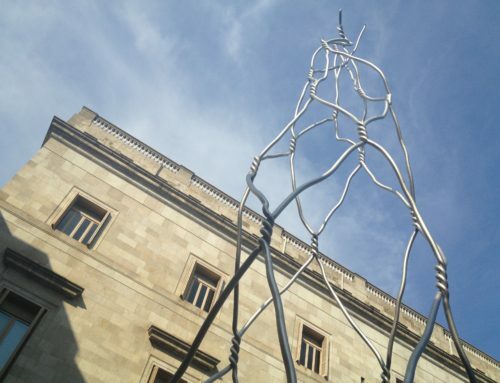 Girona is just 103 kilometers north of Barcelona, making it a good day trip by train or car. We took the train, which was really easy and comfortable. The padded seats were roomy and had foot rests and fold down tray tables. There was plenty of room to store handbags and water bottles. It was a great way to travel – much more relaxing than driving. 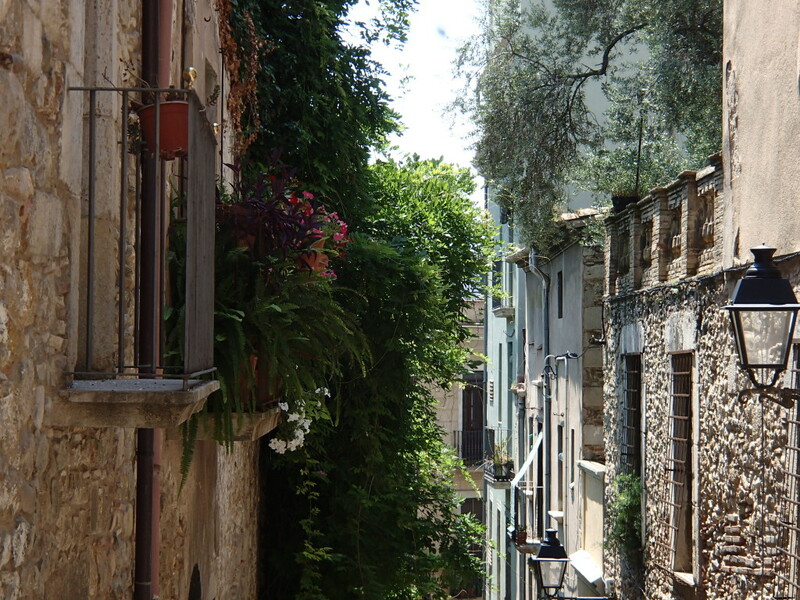 For a small city, Girona is packed with a variety of sights. There are historic buildings, churches, city walls, quaint narrow passageways, museums, shops, an intimate plaza, and of course, the Onyar River. In fact, instead of a day trip, you could do an overnight or even stay a few days. 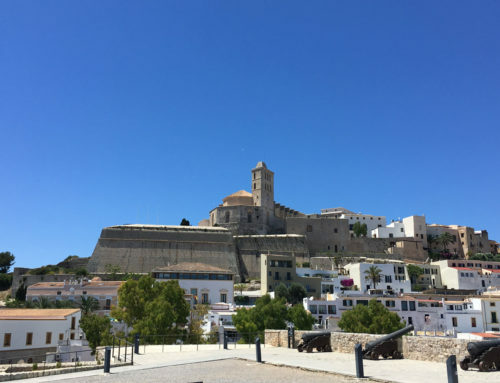 The Romans built a fortress around the city, Forca Vella, in the first century BC and some sections of the walls still remain. The Jewish Quarter, cathedral, and several museums are located within the fortress. The Jewish Quarter (also called Call) is awesome. Picture well-preserved narrow streets and passageways, balconies with bright flowers, and interesting doorways. What a fun place to wander! 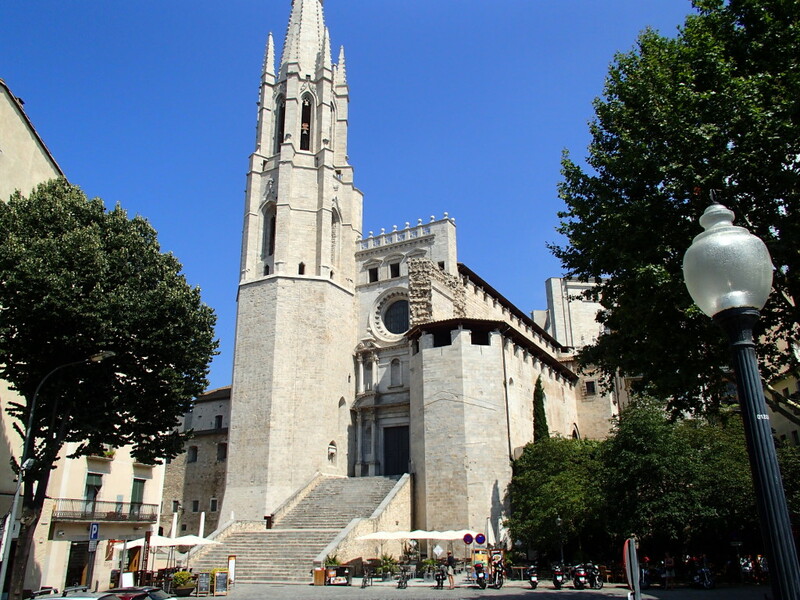 The Basilica of Sant Feliu was the first cathedral in Girona. You can go inside and view the art exhibits and sarcophagi. 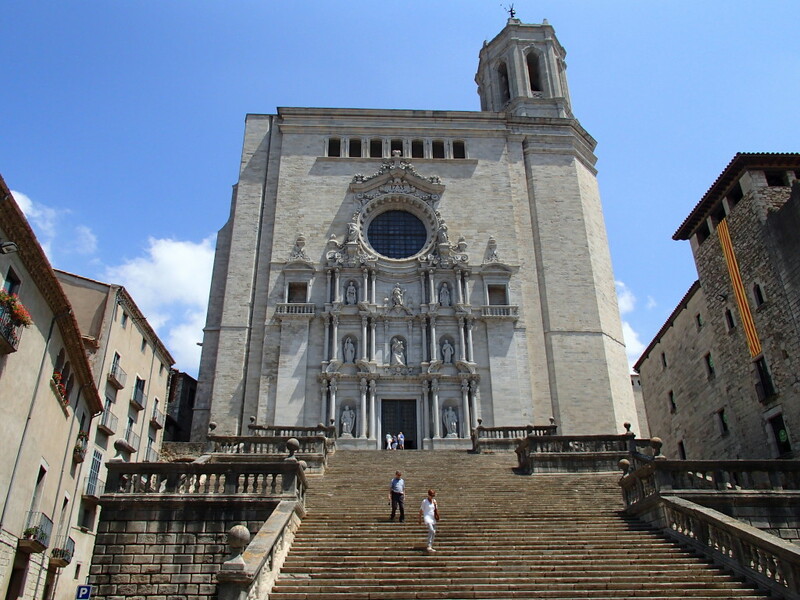 Construction began on the Girona Cathedral in the 11th century and took 7 centuries to complete! The entrance is at the top of an impressive staircase that starts at the base of an intimate square. The Onyar River runs through the center of Girona. One side is lined with buildings, and the other has a pedestrian walkway. A few areas of the river look like they have seen better days, for example – there are sections with low water levels. But as you get closer to the old town, there are some incredibly picturesque spots with colorful houses and striking bridges. We even watched the ducks diving for their dinner. 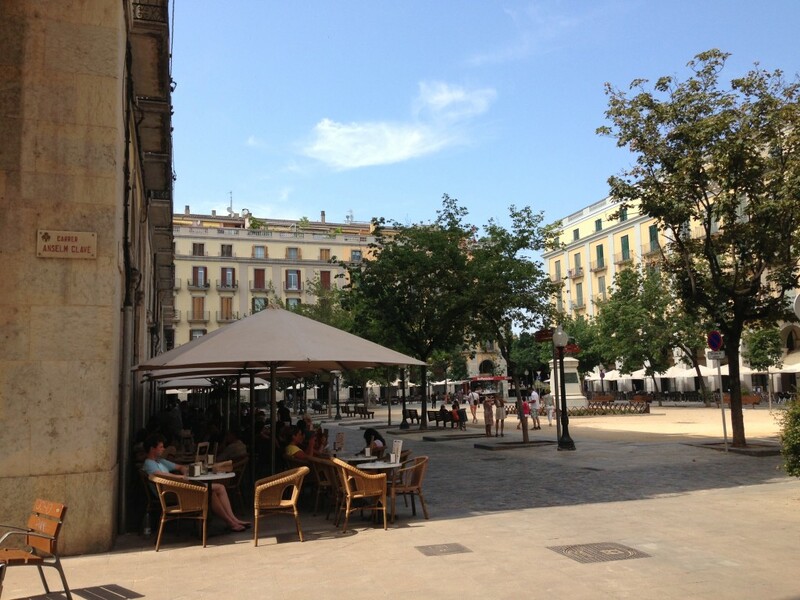 Girona’s main square, Plaça de la Independència, is lined with diverse restaurants, some traditional, some modern. In the center, there’s a sculpture by Antoni Parera which is a tribute to the men who defended the city against invaders in the early 1800s. 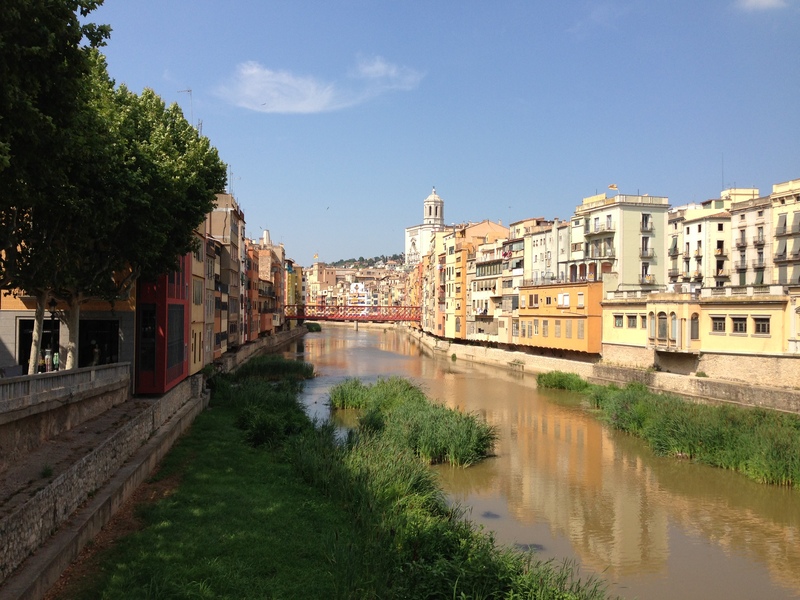 Here are a few of the attractions we would have visited if we arrived in Girona earlier or on a different day. Information: The city has a great tourism website with information on sights, attractions, restaurants, and events. Planning: Check the opening hours of the attractions you want to see (some close in the early afternoon). Also, if you like to shop, don’t go on Sunday as most of the stores are closed. Getting there: Drive or take the train. 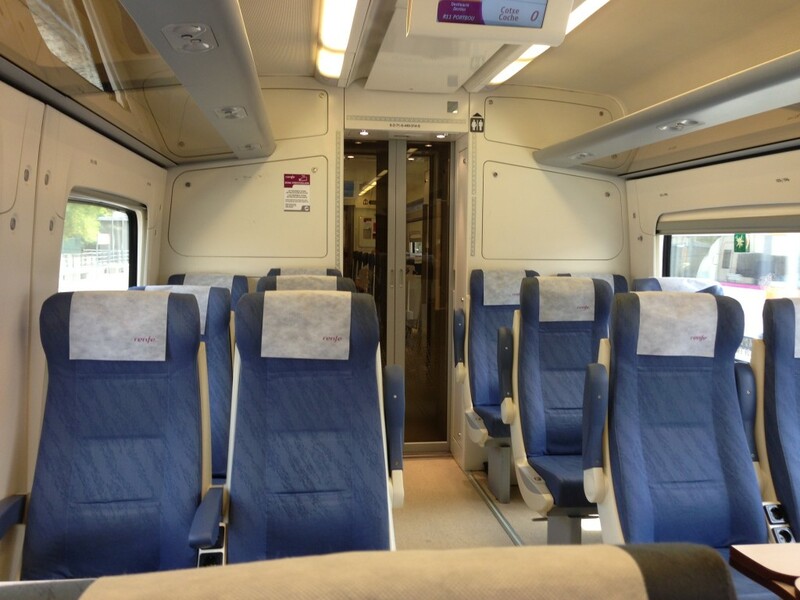 By train – there are different trains that go to Girona and the travel time varies from 40 – 90 minutes. Check the options on the Spanish Rail website. Take the metro to Sants Estacio, Passeig de Gracia, or Clot and then buy a Renfe (Spanish rail) ticket at the ticket counter or machine. 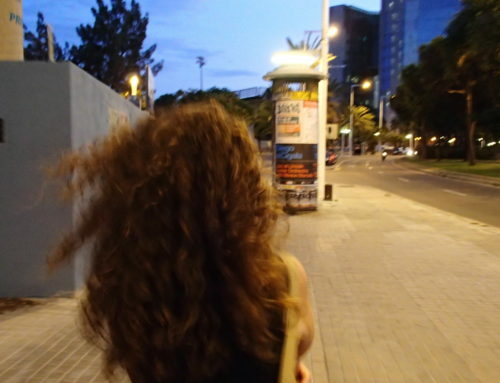 Here’s what we did: metro to Passeig de Gracia, exit and follow the signs / sidewalk arrows to the Renfe kiosk (5 minute walk), buy roundtrip tickets to the town of Portbou (Girona is one of the stops along the way). 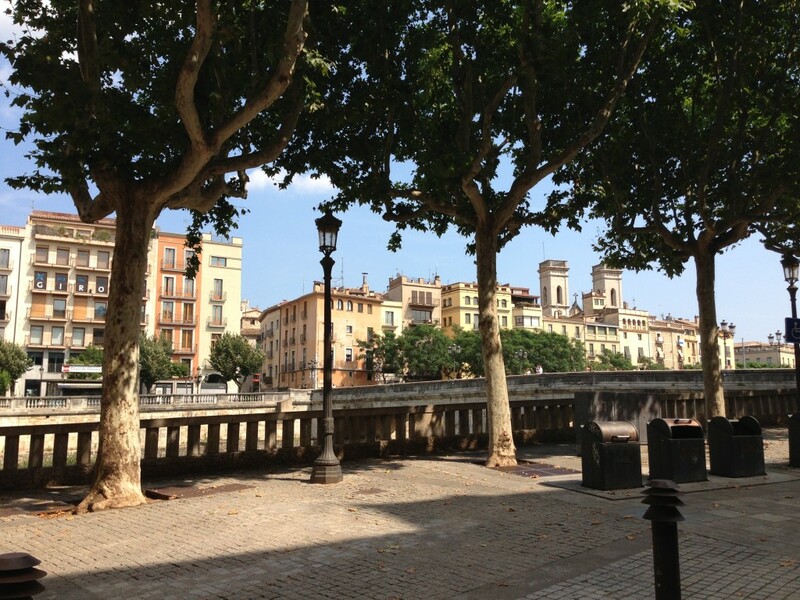 From the Girona train station, the old town and many sights are an easy 20-minute walk.